A lot of people still have strong feelings about Payne Stewart, the PGA Tour star who died in a freak airplane accident 15 years ago, October 25, 1999. I know I do – the memory is clear – where I was and who I was with when we got the news. This year it was a conscious decision to not dwell on the tragedy for the families of those on that airplane but to think pleasant thoughts about the flamboyant Stewart and his career; one that was filled with accomplishment, caring and most of all…fun. Which of course brings me to that wonderful music group, Jake Trout and the Flounders. For those who don’t remember, Jake Trout and the Flounders was a league above todays The Golf Boys boyband spoof by Tour players Bubba Watson, Ben Crane, Hunter Mahan and Rickie Fowler. Stewart’s group actually played music albeit in the eyes (and ears) of some, not great music. The band had Stewart enthusiastically blowing into a harmonica and occasionally singing. Peter Jacobsen was front man and lead singer with fellow toursters John Inman, Larry Rinker and Mark Lye playing guitars. 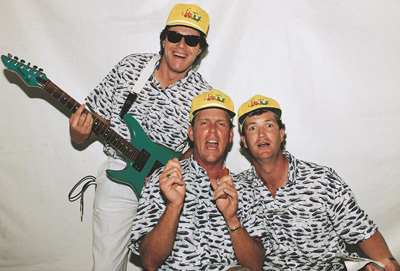 Their first gig was in 1988 at the Tournament Players Club for a players and wives clambake prior to The Players Championship. Rinker, an accomplished guitarist, was already scheduled on the program but after playing a couple of solo numbers he called on the other band members and the world was introduced to Jake Trout and the Flounders. Though Inman dropped out, the group continued as popular entertainment at tournament parties playing their all-in-fun golf-themed parodies. It was rock and roll to be sure with popular songs reworded such as “Love The One You Whiff” with apologies to Crosby, Stills & Nash – “Love the One You’re With.” There was also “(Hittin On) The Back of the Range” which of course came from Otis Redding’s “(Sittin’ On) The Dock of the Bay.” But my personal favorite was “I Love To Play” lifted from Randy Newman’s “I Love LA.”. 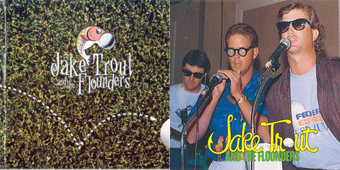 The initial performance was followed by others and Jake Trout and the Flounders seemed to have a future. Stewart, as did Jacobsen and Lye, looked at it as a diversion certainly not something to interfere with family time or golf. Rinker felt differently, wanting to get serious, hire an agent and make the band into a business. The balancing act this would have required caused a spilt with Rinker leaving the group. In 1989 a cassette album was recorded and published eventually selling 60,000 copies and in 1998 a second album on CD and a video were produced. Listen to any of Jake Trout and the Flounder’s music today and one thing for sure will hit you. It was fun, for them and for us. What better way to remember Payne Stewart?